12.9-inch iPad Pro vs 9.7-inch iPad Pro: What’s the difference? Unlike the two sizes of iPhone 6S, which are almost identical, the iPad Pros have totally different screens and cameras, as well as some altered internal hardware. This means that there are very real reasons why you might want the smaller iPad Pro more than its big brother, aside from the size and price differences. 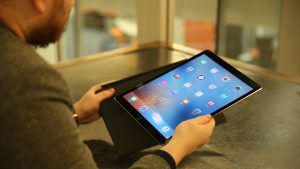 Video: Which iPad Pro should you buy? While the 9.7-inch iPad Pro has a smaller and lower resolution screen it retains the same pixels per inch (PPI) of the 12.9-inch variant and that means it looks just as sharp. Screens aren’t just about resolution and the small Pro has a fantastic LCD panel, probably the best we’ve ever seen on a tablet. For a start it has a huge colour gamut – that’s the range of colours it can display. This means it can display a more varied range of colours than the bigger screen can, and it can do it more accurately too. That’s great if you’re a designer. The newer iPad Pro also comes with a great trick called True Tone. This adapts the colour-tone of the screen based on the ambient light around you. It makes reading in bed or lower light a lot more comfortable. If you’re a designer and want perfect colours you can turn this off. The cameras are also much better on the smaller Pro. In fact it has the same front and rear facing cameras as the iPhone 6S. That makes it the best tablet to take photos on bar none. By comparison the 12.9-inch model is years behind. Finally there’s the size to consider. I found the smaller iPad Pro a great deal easier to transport and to use when out and about, particularly on a plane where the large iPad Pro just wouldn’t fit comfortably on the folding table. If it sounds like I’m recommending the 9.7-inch iPad Pro over the big one you’d be right, in most cases it’s better and it’s almost £200/$300 cheaper, but there are a few exceptions. The larger screen means a larger keyboard and the 12.9-inch version is a lot easier to type on. It’s also a bigger canvas if you’re using it as a graphics tablet with the Apple Pencil. There’s also a little more grunt behind the big iPad Pro. It comes with 4GB instead of 2GB of RAM. In day to day use this doesn’t seem to make much difference, but if you like to work with large AUTOCAD files or do lots of video editing on the go this could save you time. 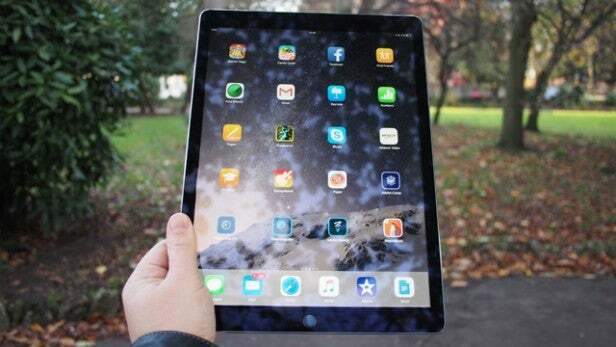 To read about the smaller iPad Pro click here or read on for the 12.9-inch model. What is the iPad Pro? The iPad has been more successful than Apple could have hoped for. Sure, the company was aware that its handsome slab of glass was going to be the perfect platform on which to bring folk closer to content – be that web browsing, watching videos or casual gaming. What it may not have foreseen, though, is the slew of third-party peripherals and apps that have been designed to extend its functionality beyond solely a “play thing” into a workhorse too. Enter the iPad Pro, the daddy of all iPads thanks to an enormous 12.9-inch screen. More than two inches bigger than the iPad Air 2 – and five more than the iPad mini 4 – the iPad Pro provides around 80% more viewing area when compared to its 9.7-inch counterpart. The iPad Pro is bigger than all iPads that have gone before it – although incredibly, this increase in size is delivered in a package that’s only 33g heavier than the first version released back in 2010. Every other feature of note receives a boost too. The screen has a higher resolution, there’s a brand-new A9X processor and 4GB of RAM. Apple claims the iPad Pro is faster than 80% of portable PCs shipped last year, and while I’d take that declaration with a pinch of salt, it may not be too far off the mark. The reason being that the vast majority of laptops sold tend to be cheap and cheerful – particularly with the advent of the Chromebook. The real question is, does it have what it takes to be the laptop replacement that closest rival, the Microsoft Surface Pro 4, is aiming to deliver? Would you rather have a iPad Pro in your bag than a MacBook or Dell XPS 13? For some, the answer is yes. 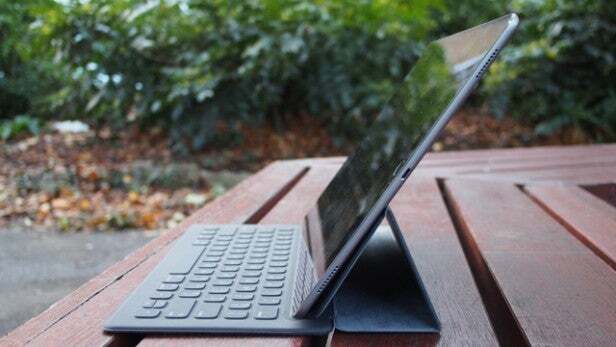 The iPad Pro is a stylish, powerful tablet that, when combined with a keyboard and Apple Pencil, has the ability to stand toe-to-toe with traditional laptops – despite running a mobile operating system in iOS 9. Those accessories are key, though. Without them, the iPad Pro is just an oversized tablet – great for entertainment and consuming web content, but not much else. Unfortunately, as with most things Apple, neither come cheap. The keyboard costs £139/$169, while the less essential Pencil will set you back a hefty £79/$99. Add this to the £679/$799 cost of the basic 32GB Wi-Fi-only model, and you’re looking at a considerable dent in your wallet. Holding the iPad Pro makes you feel like a little kid, especially if you normally use an iPad mini. There’s just so much of it. In all other respects, the iPad Pro is identical to the smaller tablets in the range. You get the excellent Touch ID fingerprint scanner built into the home button, a power button and volume controls. Aside from the Lightning port for charging and connecting to a computer, and a front and rear-facing camera, that’s about it. Like all of Apple’s tablets, the iPad Pro is a simple proposition regardless of its “professional” moniker. Like all other tablets in its range, the iPad Pro is also super-model thin, just 6.9mm to be precise. 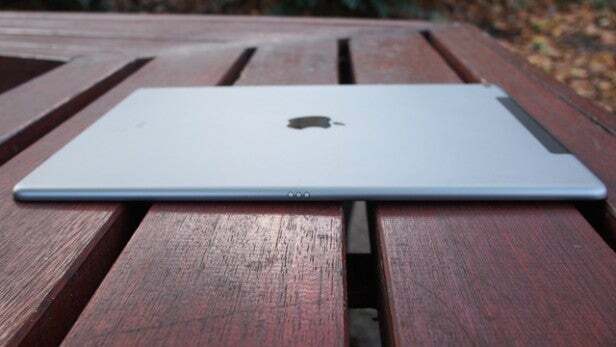 So even though it’s light and slim, its sheer size means you won’t be comfortable using the iPad Pro with only one hand. In fact, it’s a handful even when using two. This is where the Smart Keyboard becomes handy. It connects via three small magnetic points on the left side of the device, which allow for both data and power to transfer. As a result, it doesn’t require a Bluetooth connection or charging. Thin keyboards for tablets have come on leaps and bounds, with the Microsoft Surface keyboard being among the best. The iPad Pro’s unit is almost as good – except that it doesn’t include a touchpad; you need to use the screen. A lot. 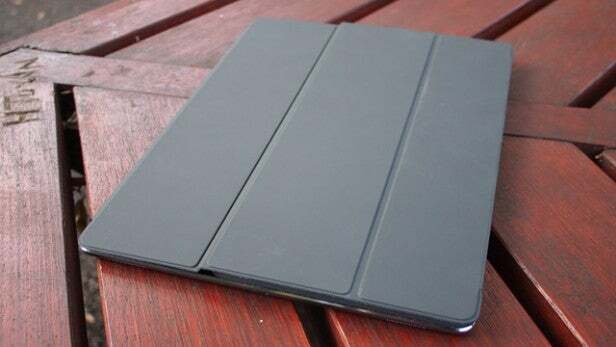 Covered in a tough fabric, which makes it robust and water-resistant, it also serves as a screen cover for the iPad Pro. It comes with a full Qwerty keyboard, with low-profile keys that help retain the iPad Pro’s overall slenderness. There’s still adequate travel for you to know that you’ve hit a key, and they’re large enough and spread enough to make accurate typing a doddle. Unlike the latest Microsoft Surface tablets, which feature adjustable kickstands, the iPad Pro has only one screen angle. It’s good for typing, but is a little too laid back for my liking when placed on a bedside table. I found myself having to use a small book to prop up the rear and bring the screen a little further forward for some late-night Netflix binging. Where the iPad Pro trumps the Surface is with stability. It provides a solid foundation whether used on a table or, crucially, on your lap. In fact, I found that typing with the iPad Pro on my lap was more comfortable than using my laptop, primarily because my thighs didn’t get singed by the hot components, nor did the fans get blocked by my jeans. Keyboard shortcuts work too, but only for apps that support them. All of Apple’s native apps – Pages, Notes, Numbers and Keynote – are good to go; Google Docs isn’t. Shortcuts do appear at the bottom of the screen close to your fingers, which helps, but this isn’t ideal. App developers will catch up, but at the moment shortcuts aren’t quite the benefit they could be. It’s the same story with video apps. I found myself regularly whacking the spacebar to pause videos on YouTube only to realise that I wasn’t using a Windows 10 laptop. Touch the screen it is, then. Apple’s keyboard isn’t the only version out there for the iPad Pro. 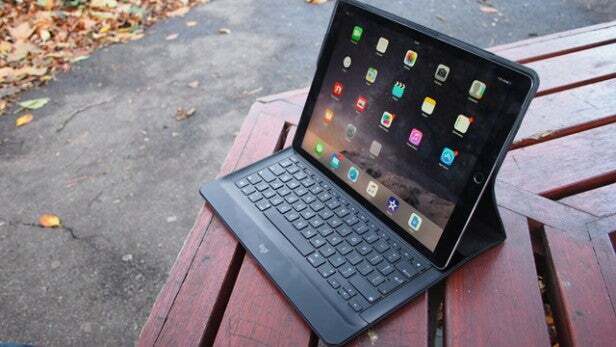 Logitech, too, has released the backlit CREATE keyboard that covers the iPad Pro entirely. Slightly cheaper and a lot chunkier than the Smart Keyboard, it makes the iPad Pro look and feel far more like a full-sized laptop, especially since the keys have more travel. It also comes with handy shortcuts for switching apps, adjusting volume and brightness, and positions the iPad Pro a little straighter. It’s the keyboard I’d choose to pair with the Apple’s giant tablet. The iPad Pro comes close to emulating the form and function of a laptop, but it isn’t quite a replacement. If, like me, you spend much of your day typing then you’ll miss a trackpad and screen pointer for editing. The post iPad Pro appeared first on Trusted Reviews.